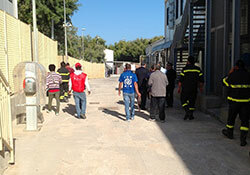 On 16−19 May 2012, representatives of the regional health authorities in Italy and WHO assessed the facilities for both migrants and health services on the islands of Lampedusa and Linosa, the entry points to Europe for many migrants from North and sub-Saharan Africa. Here are the mission’s findings. Improvement to the quality of, availability of and access to water and sanitation facilities, and infrastructure in general, is urgently needed. Facilities in the migrant centre on Lampedusa need further improvement and development, after migrants set the centre on fire in August 2011. The migrant centre, the first point of assistance on the island, has only 250 beds at present: about a quarter of normal capacity. Contingency plans should be developed to address an emergency scenario: a large influx of migrants that exceeds the capacity of current water and sanitation facilities. The plan must also secure migrants’ access to health care and maintain the quality of services for the resident population. The mission’s goal was to determine the public-health risks and vulnerabilities related to the islands’ infrastructure, assess preparedness efforts and provide a ministerial task force with recommendations on ways to strengthen coordination and service provision in the event of a large new wave of migrants from North and sub-Saharan Africa. The mission’s findings and WHO recommendations were presented and discussed at a series of meetings of a task force on migration and health. Its members comprise representatives of WHO; the Italian ministries of health, interior and cooperation; the Sicilian health authorities; the National Institute for Health, Migration and Poverty (NIHMP); and the Italian Red Cross. Professor Renato Balduzzi, Minister of Health of Italy, will present the recommendations to the Italian Government, in the form of national guidelines on migration and health. The mission made its assessment using the new WHO toolkit for assessing health systems’ capacity for crisis management. Health authorities can use this standard, web-based methodology to assess a health system’s preparedness at geographic points recognized as migrant landing sites, in order to identify gaps in planning and monitor progress in improving preparedness. In 2011, about 60 000 people unexpectedly migrated from Africa to the island. Although Lampedusa had previously been a prominent destination for migrants seeking to enter the European Union (EU), enhanced police efforts in Italy and Libya had closed this route in 2008−2009. During the 2011 crises in North Africa, concern arose about the welfare of migrants arriving on the island. Sometimes 500 arrived in a single day, so the single migrant centre, designed to hold 800 people, reportedly contained several thousand. Many were relocated to Sicily and the Italian mainland, where there are additional processing capabilities. The Italian coastguard directed about 1200 people to the island of Linosa, 56 km north of Lampedusa. Those arriving in 2011 were mainly African migrants (mostly Eritrean and Somali) fleeing Libya, and Tunisians leaving their country because of political unrest. Health conditions in the migrant centre deteriorated significantly in 2011, when residents set it on fire and clashed with the police.